A closer look at the three main types of slitting; Razor, Shear and Score. There are three main slitting methods for slitter rewinders and it is important to understand which method or methods work best for your material mix. The following is a look at the 3 main types, their advantages, and the products on which they generally work best. 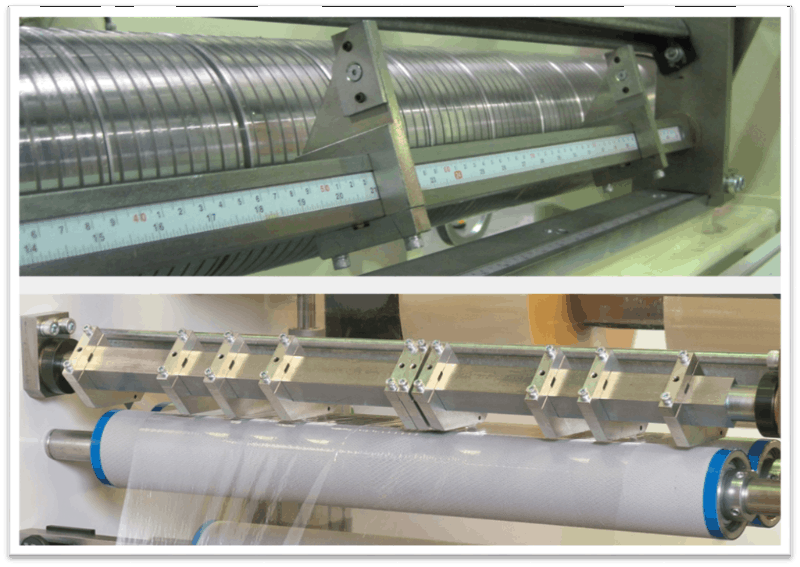 Razor Slitting uses razor blades mounted at an angle in individual holders or as multiples in cassettes to slit the moving web. There are two main types of razor slitting; Razor-in-Air (top) and Razor-in-Groove (bottom). The former requires no extra support at the slitting area and is better for slower speeds. The latter uses a roll with grooves that provide additional support at the point of slitting for higher running speeds. 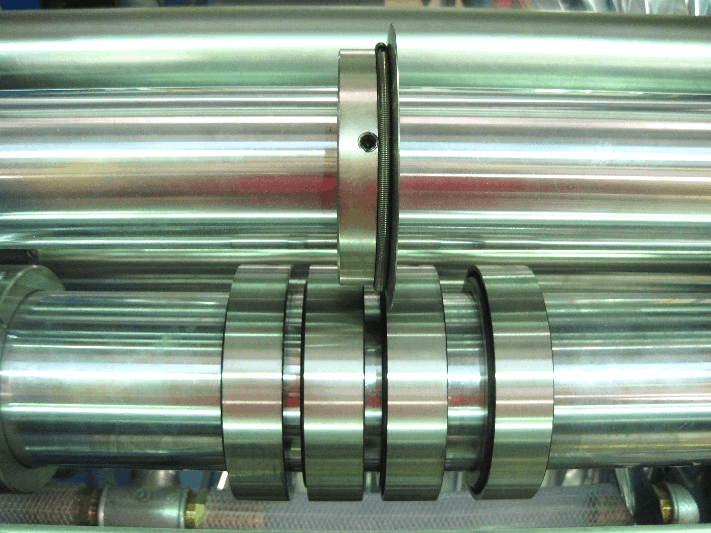 Razor slitting has low tooling costs, with simple adjustment and maintenance. It’s generally best used for thin films and light foils. Shear Slitting uses a male and a female circular knife to create a rotating “scissor” effect on the incoming web. The female knives are shaft mounted and the male knives can be in individual holders (left) or shaft mounted (right). This method of slitting provides excellent slit quality at high speeds, reduced dust generation, and great knife longevity. Shear slitting can be used on a wide variety of materials including, but not limited to: films, paper, laminates, tapes, textiles, foils and more. Score Slitting or Crush Cutting is likely the most widely used form of slitting, especially for older slitter rewinders. This method uses a rotating knife pressed against a hardened roller, sometimes referred to as an anvil roll or crush roll. As with razor slitting, the adjustment is simple when changing from one slit width to the next. 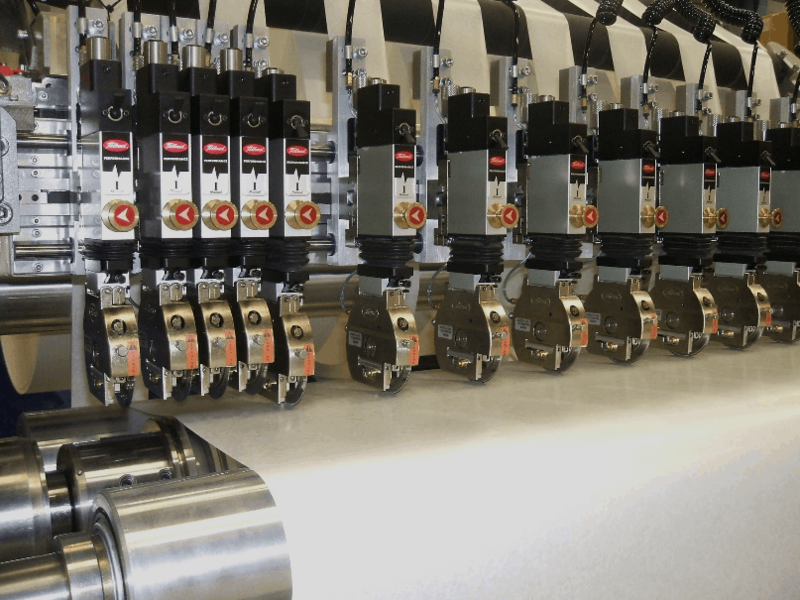 Much like shear slitting, this can be used on a variety of materials as well including tapes and self-wound adhesives, textiles, non-wovens, foams, rubber and more. Each of these three slitting methods have proven their effectiveness in the industry. If your material mix lends itself to more than one form of slitting, consider having multiple in one machine. 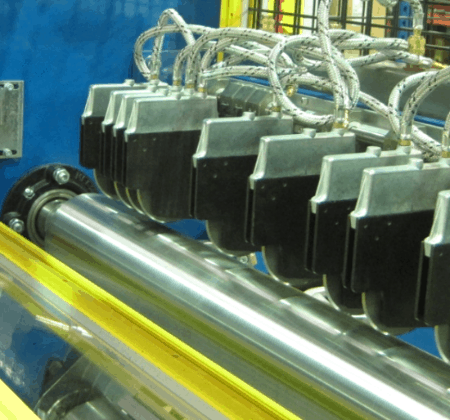 At Elite Cameron it is common for us to supply machines with two, generally shear and razor or score and razor, but we’ve also supplied machines with all three forms of slitting.